Gibson released its 17-inch wide, single-cutaway, maple-bodied, maple-necked, double f-hole, triple P-90-loaded ES-5 electric archtop in both Sunburst and Natural finishes in 1949. Complete with all the ornate trimmings that Gibson could muster - including gold- plated hardware, mother-of-pearl inlays and multiple-ply binding throughout - it was an apex of guitar craftsmanship and the result of an evolutionary course that can be clearly traced back to the company’s beginnings at the start of the 20th century. Gibson was founded partly on the basis of Orville Gibson’s 1898 patent relating to carved arched instruments. Startingin 1902, its very first archtop acoustic guitars (the L, L-l, L-2 and L-3) appeared with round soundholes. In the pursuit of even greater projection and tonal enhancement, Gibson recruited sound engineer and master luthier Lloyd Loar, resulting in its first f-hole guitar, the L-5, in 1922. By 1935, while continuing on the quest for increased guitar volume and clarity, the L-5’s body size had advanced from 16 to 17 inches, and the following year, Gibson’s first Electric Spanish model, the ES-150, arrived, marking the dawn of a new era. 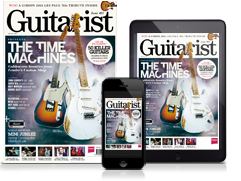 Soon after the groundbreaking ES-150 arrived in 1936 (complete with Charlie Christian pickup), Gibson increased its Electric Spanish range with the ES -100, ES-250 and ES-300 in 1938,1939 and 1940 respectively. However, things had only just got underway when World War II forced a temporary pause upon proceedings. 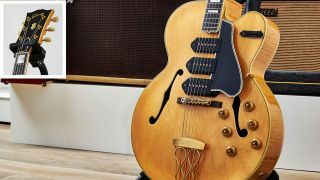 In the late 40s, Gibson recommenced ES production in earnest with its larger-bodied, P-90-equipped guitars, including the revamped ES-150, the ES-125, and the 17-inch ES-300, accompanied by its Premier/cutaway version, the ES-350. It was this guitar, alongwith the 17-inch L-5 Premier/cutaway, that inspired the ES-5’s complex design, and to which the guitar owes its unique look and sound. When the ES-5 was originally released in 1949 (pre-dating the flagship Super 400CES and L-5CES electric archtops by two years), it was equipped with three individual volume knobs corresponding to each of its three P-90 pickups and a master tone knob. All pickups were active simultaneously, therefore varying the guitar’s sound was akin to operating a mixing desk, namely balancing multiple volume sources. This rather unwieldy arrangement was revised in 1955 - a pickup selector switch was added in place of the master tone control on the upper treble bout, and the guitar was fittingly rebranded the ‘ES-5 Switchmaster’. This new addition suddenly made it possible for each pickup to be selected individually, as well as in unison, which - alongwith individual volume and tone controls for each P-90 - made for a uniquely versatile electric guitar, both on stage and in the studio. Indeed, it soon became an instrument of choice for influential Sun Studio recording artist and king of rockabilly, Carl Perkins. When the ES-5 Switchmaster was loaded with three PAF humbuckers in place of its P-90s in 1957, it changed the fundamental character of the instrument entirely, turning it into more of a distinctive rock ‘n’ roll machine than a progressive jazzbox (although it remained a little of both! ), and as such, it became a go-to guitar choice for Frank Zappa and Steve Howe. Perhaps due to its odd blend of tradition and innovation, however, it didn’t turn out to be as popular as Gibson intended and was subsequently axed from production in 1962.